As part of the patch on 2018-08-17 homins can use bright new Gubani Fortune Wheel. The goal of the change was to make usage more comfortable, spending tokens less painful and bring more fun for all gamblers. Also, the variety of rewards was extended. And even when you loose, you might be suprised! The wheel is located in each capital as well as in Marauder camp. You are now able to use new types of tokens, increase your chances by using more tokens at same time and also choose how many times you wish to spin the wheel. However, when you try the new wheel for the very first time, you might be confused. If you wish to try some gambling, first thing you have to do is to choose the type of tokens you will use (0) by clicking on the token icon. You can also see how many tokens of the selected type are left in your pocket (1). Next you can choose how many tokens you wish to play at once. You can set from one (as original wheel did) up to five tokens, choosing from a drop-down selection next to the chosen token icon (2). The more tokens you use, better chance of winning you have. Additionally, you can set number of spins of the wheel by clicking on the numbers around the wheel. From one spin up to ten (3). It works as multiplicator of tokens. For example, when you play 3 tokens with 5 spins, it will actually use 15 tokens in 5 attempts by 3 pieces. When your preferred options are set, you can try your luck and click the button in the center of the wheel (4). By clicking the button, it will insert the selected tokens and the game will start. The chance of winning depends on how many tokens you use at the same time (2) and you can see the percent chances above the button (5). In case you win, your reward will appear in a loot window just as it was with the old version. In case you are really lucky, you are offered to choose your reward. You may take the items you won or some better quality tokens and try to win even more and better rewards using them later. When you think it was enough of risk for now, you can close the wheel clicking the closing button (6) and come back later to try your luck again. Along with the new wheel, homins are now able to get new types of tokens of five classes: basic, fine, choice, excellent and supreme. Better tokens give you chances to win better rewards, but are also harder to get. All new tokens are stored in your SPECIAL bag so they now take no space in your inventories. Your old tokens will not work with the new wheel, but you can ask Fortunate Gubani attendant to change your old ones for new basic tokens, one for one or buy new. It is possible to buy basic and fine tokens only. The only other way to get new tokens is, participating in various events or win some by gambling with the wheel. a) Sometimes the wheel just stops working. c) Understanding that user selection of what categories of rewards are in play is not feasible, has any thought been given to the fact that many rewards are not usable ... for example cats for subbed players, low level "Wundahmat"....The latter wouldn't be so bad if tradeable. d) What reward items are going to be "tradeable" ? e) The OP Flowers provide something that few players use. I love the red and blue ones, but I'm in a small minority. Giving away flowers rarely brings a response. While I certainly do not want to diminish the importance of OPs, I think the **rare** reward of an OP mat would add some excitement without diminishing the value of an OP for the player base that is excluded from opportunity to obtain same. f) The issue of dupes.... Lost about a dozen rewards because I already had a BYMGO game of that number. Is there a way to avoid getting a 2nd rucksack for apartment, duplicate wigs, etc. - Wigs reward rate seems low ... (17/150), a third of those coming from the choice tokens. - Gubani Mount rate seems low ... (5/300) Gubani Mount and all those came from Basic Tokens ... had 6 but one disappeared after wheel crash. At 1 part per stack, the idea of requiring 300 stacks seems daunting. Using a better class of tokens raises not just your base chance to actually win something but also brings a better chance of winning something useful. If you right-click a wheel token in your SPECIAL bag, you can list all the types of rewards and your chance of obtaining them. While you play your tokens on the wheel you might also win a Pay2Win token that allows you to enjoy one of the Fortunate Gubani minigames. The rules are really simple - reveal one of 25 boxes (0) to find a symbol, and then find the symbol in the table above (1) to see your reward. You can drop (2) the used token after. 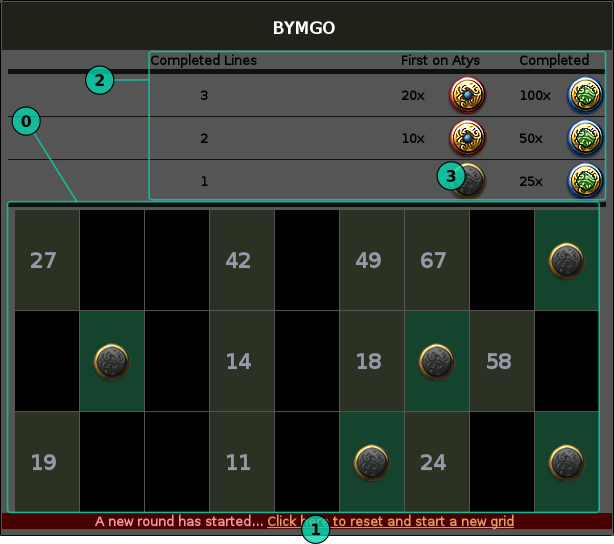 BYMGO is another Fortunate Gubani minigame, a variation of the Bingo game with 75 balls. Besides other rewards you can probably also win some tokens with numbers on them, you can filter all of these in your SPECIAL bag. These numbers are used to mark numbers on your BYMGO ticket grid. When you right-click a numbered token in your SPECIAL bag it will create and open a BYMGO ticket. There you can see a grid with random numbers (0). Play all tokens with numbers that are presented in your grid to mark them. The goal is to complete all 3 lines and close the current round. Your BYMGO ticket is saved in your SPECIAL bag. When a player is the first to finish the current BYMGO, the round ends. The winner can continue with a new grid (1), other players can decide if they want to finish the current round (to get choice token rewards) or drop the grid and join the new round. If you go for a new grid, you will lose the progress on the old ticket but you can keep the unused numbered tokens in your SPECIAL bag and use them on the new grid. 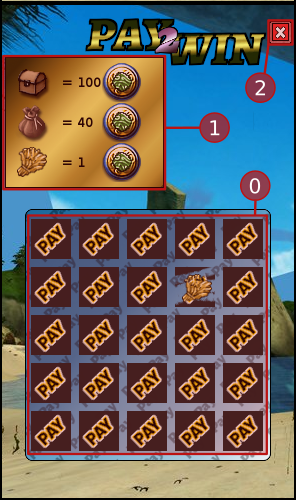 Rewards for the play are displayed above the grid (2) For every completed line (when you mark all numbers in the line) you gain a reward of choice tokens. If you are the first to complete the line or grid in the current round you also get a reward of excellent tokens.If the reward for being first in finishing a line has already been taken the reward image is grayed-out (3). I'm actually impressed with the implementation of this new wheel. Agreed. While technically impressive, it's frustrating enough that interest fades quickly as the novelty wears off... which, for me, was about two minutes.